One of the most important elements of a successful wood flooring installation job is the application of the finish. A perfect installation can be distorted by a bad finish job, and a mediocre installation can often be saved by a good finish job. The customer’s expectations of what the finish is supposed to do can trump a good or a bad finish job. Today’s finishes continue to evolve, and as professionals in this trade, we are expected to understand the nuances of every finish in order to create what our customers ask us to produce. Fortunately (or unfortunately, depending on how you look at it), all finishes and finish systems are not identical in their application or their performance. Finish Wear Discrepancies: When the performance of the surface coat of finish is not meeting expectations. Finish selection used on the floor is not properly matched to the use of the floor. Maintenance is a common culprit. Poor maintenance practices may include failure to remove grit from the floor’s surface fully, missing or unsuitable area rugs, walk-off mats, non-slip pads, worn or inadequate floor protection under furniture, pet nails, vacuuming with the carpet setting (beater bar) on the wood floor surface, and most common is using too much or the wrong cleaning product (including steam cleaners) to clean the floor. 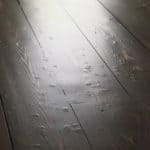 The performance of a new wood floor installed in a new construction jobsite often comes into question. Other than the normal heavy construction traffic, other causes for finish wear on the jobsite include inadequate or no floor protection used during construction. Another cause is when floor protection is applied, grit, dirt, and construction debris under the floor protection causes finish wear. Finally, the maintenance company improperly cleaning the floors. Finish-related issues may include any of the following: improper finish application, inadequate jobsite conditions affecting the drying and curing of the finish, improperly mixed finish, coating over a not-yet cured sealer or finish coat, a bad batch or finish used at or beyond its expiration/best-use date, using finish that has been exposed to extreme temperatures, floor use before the finish has fully cured, floors covered/protected (area rugs, floor protection) too soon after finish application, and inadequately cured site-cured UV finishes. 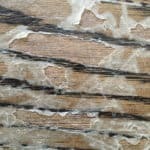 The sand job can also play a part, including inconsistent sanding procedures accompanied by an inadequate abrasive grit selection for the floor being sanded and/or the finish being used. This often results in high points/peaks coated with less finish than the low points/valleys. For factory-finished flooring, the high points/peaks of sculpted floors, distressed floors, overwood/underwood, etc., wear through faster than low points/valleys, inadequately cured or improperly applied factory finishes. 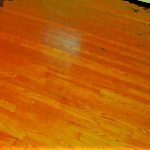 Scuffs: Marks or abrasions left on a wood floor surface or finish. Most scuffs are maintenance-related. 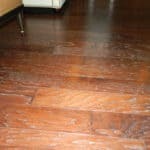 Some of the sources may include grit or debris rubbed across the floor’s surface, improper maintenance products, which can leave a residue or film on the surface of the wood floor, often have a tendency to scuff or become marred, and hard, stiff soles on shoes, boots, sports cleats, high heels that are not specifically designed to be “non-marking soles.” These normally stem back to the customer expectations of the floor. Scuffing can also be directly related to the finish. 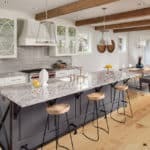 Some of the causes may include early foot traffic or use of the floor on uncured finishes, improperly mixed, applied, or stored finish, expired finish, or a bad batch of finish. UV-cured finishes can also scuff if it was improperly cured. Impact Damage: A depression, mark, or wound on the surface of the finished wood flooring. All species and types of wood flooring and wood flooring finishes are prone to impact damage resulting in scratches, dents, and gouges. 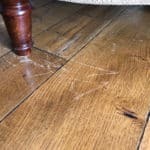 Common causes for scratches, indentations, and gouges on wood flooring may include high heels, sports cleats, pet nails, appliances such as refrigerators or stoves, furniture legs, piano feet, dropped objects, shipping or packaging damage, installation damage, and construction damage. Proper identification of each type of damage may help in the assessment. Scratches are caused by applied horizontal and vertical forces and are typically only in the finish coats. A fingernail can’t feel the ridge. Deep scratches are typically through the finish coats and have torn the wood fibers. Cross-grain scratches are deep scratches and are oriented perpendicular to the direction of the flooring, often crossing multiple board widths and have a higher probability of exhibiting wood fiber tear. Deep scratches, usually termed “gouges,” are typically through the finish coats and have torn the wood fibers. As scratch damage increases in severity, so does the likelihood that the damage will also include denting. Indentations are notches, grooves or depressions on the surface of the flooring. Indentations are caused by applied vertical and/or horizontal forces on the flooring surface. When only vertical forces have been applied (dropping an object) these depressions are typically isolated to the shape of the portion of the dropped object that contacted the floor. Indentations may not always be accompanied with finish tear. 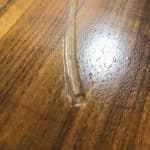 Wood bruises originate from a previous force or trauma to the surface of the boards that is not normally noticeable during the installation or handling of the product. 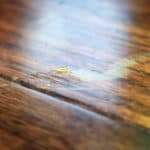 This damage can become exposed with an increase in moisture, such as with the introduction of water through water-popping, water-based finishes, water-based stains, or similar reactive conditioners. Various rug types or backing materials that can leave an imprint in the floor finish system, or plasticizer migration from some non-slip backing pads used under area rugs can leave a waffle-like pattern etched into the finish system. Area rugs or non-slip area rug pads that are incompatible with the wood floor finish systems or have been placed over uncured finishes can leave discoloring stains, blushing of the finishes, or impressions in the finish as well as the wood. Floor protection systems (corrugated cardboard, paper, pads, etc.) laid over the wood floor before the finish is fully cured (per manufacturer instructions) can leave imprints within and on the finish system. Floor protection systems with any sort of grit or debris caught between the protection and floor can leave impressions in the finished floor. Factory-finished flooring packaging material has been known to transfer to the face of the flooring boards. Finish Adhesion Failure: Occurs when there is a loss of film-finish adhesion to the flooring surface or between coating layers. Finish adhesion failure is broken into two categories: chipping/flaking finish and peeling finish. 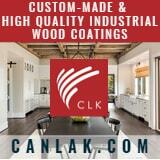 Poor adhesion between coats of finish as a result of contamination, poor abrasion, improper preparation, incompatible finishes, or even using different types of finishes on subsequent coats. 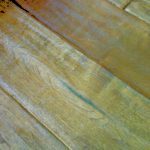 With some more-brittle/less-elastic finishes used on some factory-finished floors, a gain or loss in moisture, and subsequent dimensional changes within the wood can result in finish chipping or shearing away from the wood. Excessive finish on the edge of factory-finished flooring (also known as cornicing) can chip as the boards are being driven together during installation. Use of steam mops to clean wood floors can cause the finish to chip away from the seams or voids in the wood. 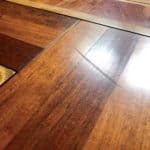 Poor adhesion between coats of finish as a result of contamination, poor abrasion, improper preparation, incompatible finishes, finish applied over undried or insufficiently wiped stain, or even using different types of finishes on subsequent coats. When finish peels from a previously finished floor that has been recoated. The causes may include improper preparation, inadequately cleaning the floor surface prior to recoat, poor abrasion in bevels, insufficient or incompatible finish and adhesion system selection, or incompatible finishes. NOTE: Factory-finished floors marketed to be stain resistant cannot be recoated. Stain resistant finishes such as Perfluorooctane sulfonate (Teflon/Scotchgard) infused finishes will not accept a new coat of finish. Using tape on a finished floor that was not recommended to be used on wood floors; leaving the tape adhered to the wood floor for a longer time than the tape manufacturer’s recommendation; applying the tape to a newly coated wood floor finish; and plasticizers in the tape that have created a stronger bond to the finish than the finish has to the previous coatings or the floor. When drywall work has been scheduled after wood floor installation, the wood floor is susceptible to becoming exposed to drywall dust. Subsequent wetting/damp mopping of the surface will turn the drywall dust into a paste, which can be extremely difficult to remove from the exposed voids or characteristics of the flooring. Silt, salt residue, or other fine dust particles can become embedded in the exposed voids or characteristics of the unprotected flooring. Paint, flooring adhesive, soldering flux from the plumber, or other contaminants that have been spilled and subsequently cleaned from the surface can remain in the exposed voids or characteristics of the flooring. Improper maintenance practices such as using products and cleaning systems not recommended by the flooring or finish manufacturer, or using an old or soiled cleaning mop head to clean the floor. A Slippery Floor: Defined as the perception that the floor feels slippery. All wood floor finishes could be considered slippery with normal use. Most wood floor finishes are not usually considered to be slip-resistant, and some wood floor finishes feel more slippery than others. A few things that can cause a floor to be perceived as being slippery include the type of footwear, a person’s weight, stride length, gait, and speed that all can affect the degree to which one slides across any flooring surface. Improper maintenance practices can also cause a slippery floor. 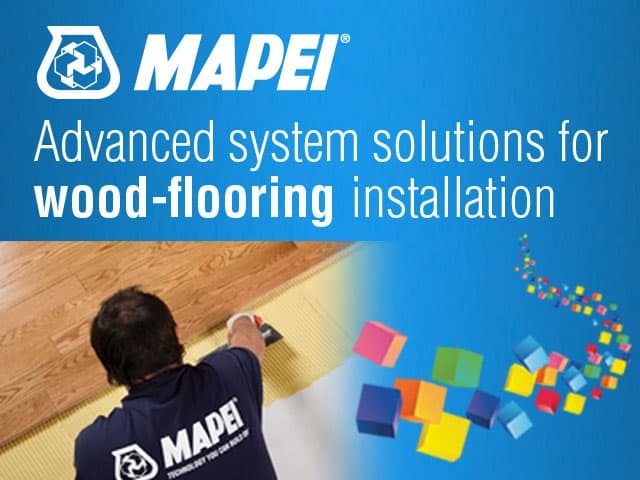 Improper maintenance may include overspray from using cleaning products on fixtures on or near the wood floor, tracking of contaminants from one floor surface onto the wood floor, using cleaning products on the floor not recommended by the finish or flooring manufacturer, using old or soiled cleaning mop heads, or simply dust or debris on the floor surface. Finish-related causes for slippery floors may include over-application of wax on a waxed floor (using too much wax) or adding non-manufacturer-recommended substances to the finish.